to 3,850 million bushels, or about 300 million bushels more than in 1936-37.
expected to modify such indications. about 760 million bushels in 1936 and 675 million bushels, the 1924-28 average. at the end of the marketing year would still be below normal. siderable substitution of other wheats, mostly hard red winter. ments by classes of wheat. spective strengthening of world markets. supplies in 1937-38 may not be much larger than during the season just ending. supplies until the Argentine and Australian crops become available next winter. 1933-34, then declined sharply as a result of successive. and 4,696 million bushels for 1934-35.
smallest supplies in recent years. Prairie Provinces, as a whole, heat seeding was virtually completed June 1. 1/ See page 7 for discussion of the domestic crop prospects. present, seems to be in the Danubian countries and in Greece and Tunisin. 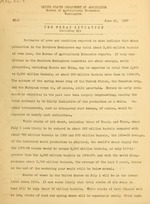 crop of 32 million bushels, compared with 29.8 million bushels in 1936.
estimate of the 1936 crop, which was placed at 352.2 million bushels. to be 15 percent above the 1936 crop. are needed to germinate the seed. Wales, where dry conditions prevail. the United States will be exporting significant quantities of wheat again. with the Danubian countries and India minor competitors. for th last 4 -yearf, by countries. Australian to about 35 million bushels. the week ended May 22. 2/ Domestic prices are discussed on page 7. June, July, and August fv.t irev:. 1931, it consists of less than the usual proportion of hard red winter wheat. is indicated, compared with 393 million bushels in the 5-year (1928-32) average. pared with 179 million bushels, the 5-year average. they would be below normal requirements. reduce the amount of such wheat exported. about 75 million bushels of hard red winter wheat in excess of usual needs. the production of hard red spring wheat and durum turned out to be. million bushels of soft red winter wheat in excess of normal needs. 3/ Imports for 1936-37 estimated on the basis of July-April imports. of 2-million bushels for the 10 years, 1922-23. to 1931-32.
prices in Liverpool _/, declined during the last half of May.and early June. show cash and futures prices in selected foreign as well as domestic markets. at Kansas City 20 cents below those of Liverpool for the week ended June 12.
on a comparatively high level on account of the scarcity of old wheat on hand. L/ See page 6 for foreign prices. Compiled from official sources except as otherwise noted. I/ Winter acrea-.e remaining for harvest. / Estimated in the Paris office of the Bureau of Agricultural Econo.ics. / Are provided for in the Plan. i/ Price of -nrcels at Li.erpool not nvpilpble. in bond from foreign wheat. :Mil bush. Mil. .bush. Mil.bush. Mil.bush. zation for the year, minus monthly exports to date. 2/ January 1 to date. are converted to United States Mnney at 'the current rtes of exchan-e.
Ij ITo. 2 V-rC '..'inter. 2/ -No. 1 Dark Kirth.-,rn Snrin;. i:o. 1 Heavy for . ::eek ended Februry 6. 3/ No. 3 :anitsb. Iforthern. 5/ H:ne-.rc.-:.n '-.eat in En;lan-.d n;.d '"ales. 6/ Centr 1 C-en. :rn wheat, :holesle trn.dc rice free Centrn! German Stati-,. .J f-J L. .OL ). 1/ Broomhall's Corn Trade News. 2/ Fort William, Port Arthur, Vancouver, Prince Rupert, and New Westminster. 3 Black Sea shipments only. but does not include items 2 and 3. Compiled from official sources, except as otherwise stated. From report of the Paris office of the Bureau of Agricultural Economics. before the'nar about equaled domestic utilization. greatly reduced but did not eliminate imports. 1936-37 amounted to 46 million bushels compared -"ith 50 million in 1935-36.
the-192g-32 average, is shown in table 11. 12 shows No. 2 rye prices at Minneapolis beginning with 1920-21.
: acres Bush. bush, bush. cent bush. bush. bush. only for June 1) plus commercial stocks as of July 1. ~/ Preliminary figure published December 1936. Crop : July Aug. : Sept. : Oct. : Nov.